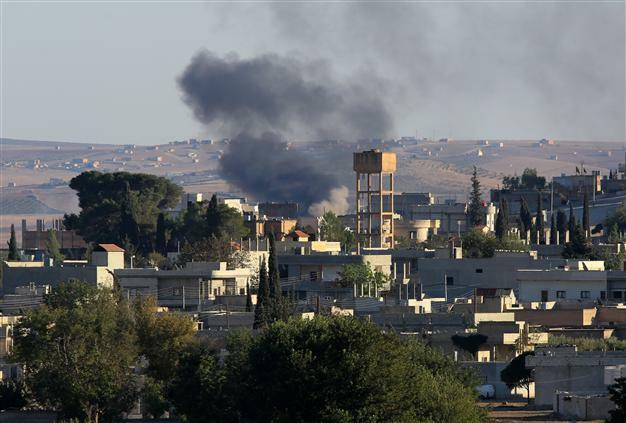 According to the Middle East Eye, a Kurdish official in Kobane told AFP that US-led airstrikes had successfully pushed back Islamic State insurgents from parts of the town and had allowed Kurdish fighters to regroup and go on the offensive for the first time. The Syrian Observatory for Human Rights, speaks about 600 Kurdish fighters been killed within the last month, however it is unclear how many civilians are left in the border town. Turkish authorities claim that Kobane has been cleared of civilians, however according to Kurdish fighters about 2,000 people, including many sick and elderly, remain trapped reported the Middle East Eye. Despite the reported gains, however, Kurdish forces are still calling for more assistance and warning that Kobane could yet fall if support is not stepped up. „We need more airstrikes, as well as weaponry and ammunition to fight them on the ground,“ the Kurdish official told AFP. The Turkey-based Kurdish Kurdistan Workers‘ Party (PKK) and the United Nations have also been calling on the Turkish authorities to open up the border to allow PKK reinforcements to enter Kobane. However, Prime Minister Ahmet Davutoglu has stayed resolute, insisting that Turkey would only allow aid and Syrian refugees to cross the border back into Syria.